Can the Chinese Dream and the American Dream Coexist? 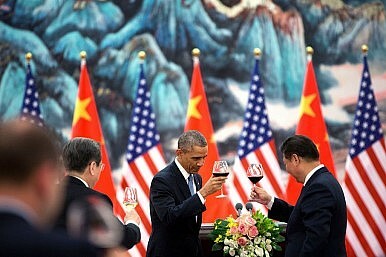 Can U.S. claims to global leadership exist alongside China’s dream of national rejuvenation? This individual-centered American Dream is all about domestic politics. But there is also an American Dream about international affairs, and it has been no less frequently and eloquently articulated by U.S. leaders. Manifest Destiny and the Monroe Doctrine, for example, amply illustrate the territorial and geopolitical ambitions of the fledgling republic. By 1917, when President Woodrow Wilson declared before a joint session of Congress that “the world must be made safe for democracy,” America, the nation, had committed itself to becoming the leader of the democratic world — if not the entire world. When Henry Luce called on his fellow Americans “to create the first great American Century,” he was speaking not only for himself, but also for a uniquely blessed nation that was soon to become the most powerful in human history. To be sure, this American Dream of global leadership faced serious challenges from the former Soviet Union during the Cold War, and there were moments of grave doubts among the highest level of American leaders. Eventually Moscow imploded, and Washington has since been the one and only superpower. In 1996 Sydney Blumenthal and James Chace coined the term “indispensable nation” to describe America’s role in a unipolar world. “Only the United States had the power to guarantee global security: without our presence or support, multilateral endeavors would fail,” Blumenthal later wrote about the intended message of this phrase. The phrase has stuck with America’s decision makers. Madeline Albright invoked it in a 1998 television interview. “If we have to use force, it is because we are America; we are the indispensable nation,” she said. “We stand tall and we see further than other countries into the future….” More recently, President Barack Obama used the phrase in his May 2014 commencement speech at the West Point. “[T]he United States is and remains the one indispensable nation,” he declared. “That has been true for the century past and it will be true for the century to come.” The American Dream of global leadership is thus to remain the world’s one and only indispensable nation. Given China’s “century of humiliation” at the hands of foreign powers, however, the Chinese Dream is understood to be primarily about the great rejuvenation of the Chinese nation, and only secondarily about the aspirations of the ordinary Chinese. It is more of a national, collective dream than an individual dream. Importantly, it is decidedly a foreign policy-oriented dream, one that aims to put China at center stage in international affairs. In fact, topping the list of 12 Socialist Core Values promoted by China’s new leadership is fu qiang, or “wealthy and powerful.” It is precisely because of the collective memory of humiliation — which is kept alive by textbooks, museums, movies, and TV shows — that the Chinese Dream is synonymous with a wealthy and powerful nation. After more than three decades of breakneck economic growth, China has certainly become wealthy and powerful, at least in aggregate terms. Consequently it has adopted a much more proactive — or assertive in the eyes of some observers — foreign policy, as exemplified by “One Belt, One Road,” the Asian Infrastructure Investment Bank, and rising tensions in the South China Sea. In the eyes of many American analysts, a rising China bent on playing a leading role in regional and global affairs is on a collision course with the indispensable nation. The American Dream of global leadership is destined to clash with the Chinese Dream of national rejuvenation — or is it? America has played the leading role in ensuring global prosperity and security since the end of World War II. There are increasing signs, however, that this indispensable nation is retreating from global leadership: from climate change to global financial reform to state-building in the Middle East. To assert leadership in forceful language is one thing; to prove leadership through concrete results is another. More importantly, if America fails to provide leadership on some pressing issues, it is incumbent on other countries (such as China and India) to rise to the challenge. In a market economy, competition fosters innovation and monopoly stifles it. In domestic politics, electoral competition leads to democracy and one-party rule results in authoritarianism. In international affairs, competition for leadership should also lead to better provision of public goods — assuming, of course, that such competition does not involve intimidation or coercion. If AIIB can provide funds desperately needed by developing countries while the IMF, the World Bank, and the Asian Development Bank cannot, these countries will rethink American leadership. Chairman Mao once said, “Let one hundred flowers bloom and a hundred schools of thought contend.” Why not “let one hundred dreams bloom”? The American Dream and the Chinese Dream are in competition, but that’s not necessarily a bad thing for the world if they can keep competition from sliding to conflict. These two nations are not destined to clash with each other; if they do, it is because of the lack of vision, creativity, and leadership on both sides. In a recent list of "hot phrases" said by President Xi Jinping, domestic affairs dominate. Will Xi Jinping Visit North Korea This Year?US Envoys Due in Beijing for Trade TalksChinese Nationalism: The Dog That Barks in the NightFor China, How Much Will the Outcome of the US Mid-Term Elections Matter?Is a Thaw Coming in US-China Relations?